Be the first to share your favorite memory, photo or story of Jearldine. This memorial page is dedicated for family, friends and future generations to celebrate the life of their loved one. Jearldine Juanita Cummings passed away Friday, April 12th, 2019 at Hospice Quality Care in Midwest City, Oklahoma at the age of 86. Jearldine was born September 3rd, 1932 in Calvin, Oklahoma to Earl Jones and Lucille (LaFave) Jones. She attended Calvin public school. Jearldine married Eugene Cummings. She was a homemaker of the home. Jearldine is preceded in death by her parents, husband Eugene siblings; Jean Keefer, Oliver Jones, Casey Jones and Alice Lucille Arnold. 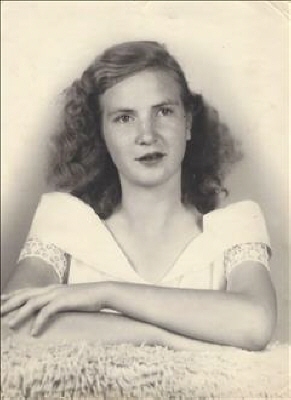 She is survived by her daughter Karen Dull and husband Robert of Wewoka, Oklahoma, sons; Jon Jones and wife Elaine of Calvin, Oklahoma, Ernest Cummings and wife Tammy of Ada, Oklahoma, and Casey Cummings and wife Yoland of Ada, Oklahoma, nine grandchildren, 18 great grandchildren, 2 great, great grandchildren and brother Robert Jones and wife Linda of Calvin, Oklahoma. Funeral service will be 2:00 PM Monday April 15, 2019 at Hudson-Phillips Funeral Home Holdenville, Oklahoma with Pastor Dane Robinson officiating. Pallbearers are Colton Cummings, Dalton Cummings, Gary Clinton, Mike Dull, Jeff Jones and Chris Jones. To send flowers or a remembrance gift to the family of Jearldine Juanita Cummings, please visit our Tribute Store. "Email Address" would like to share the life celebration of Jearldine Juanita Cummings. Click on the "link" to go to share a favorite memory or leave a condolence message for the family.